Family owned and operated jewelers for 3 generations, Firenze Jewels knows that when the time comes to “pop the question,” everything about that special moment should create an everlasting impression. 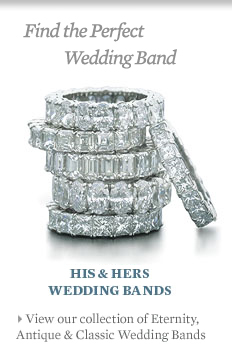 We pride ourselves in offering diverse selections of classic and antique style diamond wedding bands, anniversary rings, diamond engagement rings, and exquisite bridal jewelry. Let us help you customize and build the ring of your dreams. Our sensibility and working knowledge of diamond wedding and engagement ring design has made us an industry leader today. Located in the heart of New York City's Diamond District, Firenze Jewels provides a fine selection of platinum and gold diamond jewelry including 100% natural diamonds, emeralds, rubies, sapphires and other gemstones from around the world. We feature a large selection of diamond earrings, pendants, necklaces and diamond rings. If you are considering New York's famed diamond center, please read our Diamond District Shopping Guide. With a proud reputation for servicing celebrities and members of the art world, we invite you to visit our showroom or shop online. Firenze Jewels has built a strong and unique relationship with leading designers and world renowned artisans of diamond jewelry over the generations. Our direct relationship with master craftsmen here in the diamond district and abroad allows us to bring you the luxury of owning the finest designer jewelry pieces at tremendous value. We are proud to feature exclusive collection of designers including Simon G, Natalie K, Ritani, Christopher Designs, Charles Krypell, Leo Pizzo, Le Vian and many more. A piece of diamond jewelry is a rare gift that captures a special moment forever. Whether you are marking an upcoming celebration or wish to create your own treasured memories, Firenze Jewels has a remarkable collection of diamond jewelry fit for any spectacular occasion or simply just because. Forged from the most precious gold and platinum metals and using only the finest of diamonds and gemstones, our jewelry is made to last a lifetime. Mark your 10th, 25th or 50th anniversary with an exquisite anniversary ring.